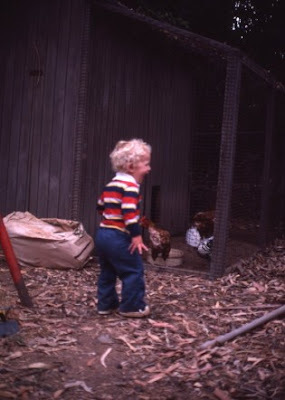 A family photo of my brother, who, even at a young age, clearly recognized that chicken wire is insufficient for the containment of Velociraptors. ALRIGHT, so last week I teamed up with a friend for a full day of Fall gardening. We started at 8 in the morning, downed some coffee and hit the road, going first to Home Depot where I wandered for ten minutes looking for a good pair of gloves. Note: Home Depot carries crap gloves. I gave up, and we headed to Sayers Fuel on Rainier to pick up a load of compost. I chickened out on loading my little truck up with a full yard. Maybe I'm being too protective. It likes to think it's a big truck, and resents when I treat it like a child. But I couldn't do it. My baby! So I paid for ¾ yards (not ¾ price, but so it goes for the non-commital), deposited half of it at my friend's garden, realized I needed way more for my own garden, and ended up back at Sayers for another full yard. This meant that not only did I have to make two trips, but that in the end I drove away with over 1 ¼ yards in my little camioneta, which is even more than I'd originally feared. Truck thought it was tough. 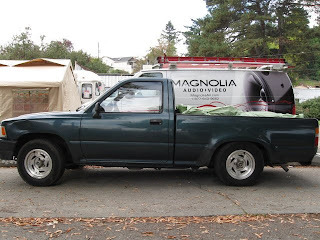 (Yes, my truck is named "Truck," after my last truck) It cruised around like a low-rider. We made a stop at the taco truck just to let the poor little guy rest for a minute, even though it played it all cool, like, "Come one guys, what are we waiting for?" We pretended we just wanted to eat tacos so it didn't have to feel wimpy about resting. Does everyone know the Tacos El Asadero taco truck on Rainier? If you don't, I suggest you get acquainted. Friends are good for big gardening days. 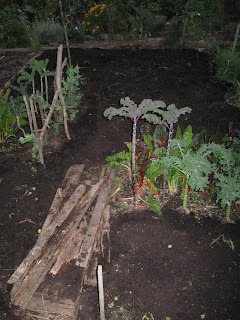 We worked in her smaller garden first, then went to town on my 200 square foot plot. 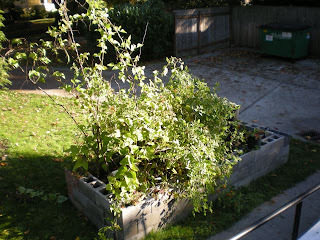 We ripped everything out except the huckleberry--which I transplanted next to the raspberries in an effort to keep the perennials together--and a couple patches of greens that I will harvest throughout the winter. One patch was sown this Fall, and the other was sown last Spring. 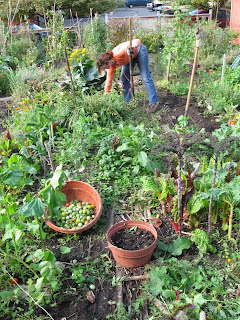 Does anybody know the reason all the experts recommend sowing a fresh crop in the Fall for the winter greens? My friend guessed that the old greens may go bitter. After bringing in most of a yard of compost, I tilled it in shallowly to raise the overall level of our soil (not something we'll do every year), then scattered a bunch of lime and fava beans atop it and chopped them in with a rake. By the time I was done it was dark. A couple days later, it was déjà vu on a smaller scale at my work garden. Then, just a couple days ago, I returned to our P-Patch and found all the little fava beans sitting on top of the dirt, like they had floated to the surface, like they thought that's where they belonged. They were not allowed on the surface. So I took a hoe and stepped gingerly across my freshly-turned beds, hacking each individual bean under. Tough love, baby.